In present scenario of time knee osteoarthritis has become a very common disease and people are coming forward to learn more about the same. Prevention is better than cure; if a person is aware of the disease then he can beat the same in all the possible aspect. Similarly the timely action against the signs and symptoms of knee osteoarthritis can help you to save a lot of money of yours that you could be spending unnecessarily. Definitely no doctor would wish you to lay down on the operation bed without trying for the other treatment options first. In this case, the first trial is given to oral medications. 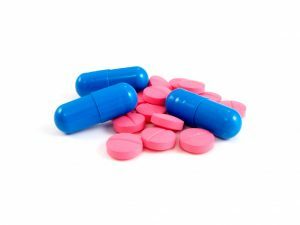 In many cases it has been found that oral medications are highly effective in the initial stage of the disease. Nonsteroidal anti-inflammatory drugs (NSAIDs), is the drug given by the doctor in the initial level of treatment. Creams or Ointments: This is a very common treatment that we even do without taking the suggestion from the doctor. Rubbing creams or ointments are found effective in the instant relief from knee joint pain. Medications Injected into Joints: Corticosteroid injections, also called cortisone shots, fight inflammation and can offer fast pain relief that may last up to several months. Actually these are hyaluronic acid injections that boost up the natural joint fluid and help the knee to work smoothly. This pain relief can last for almost 6 months. 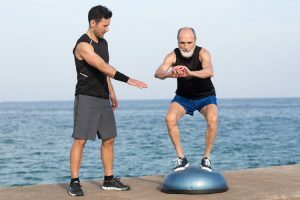 Exercise and Physical Therapy: Going for exercise and physical therapy for the treatment is also a great way out. It has been found in many cases that the disease has been cured with physiotherapy sessions. Weight Loss: Weight loss is also a treatment of knee osteoarthritis. Every pound you gain puts an extra 3 pounds of pressure on your knees. If you eventually need knee replacement surgery, your chances of success are much greater if you first lose extra weight. Nutritional Supplement: Taking the nutritional supplements to cure the disease is also a way of treatment. Few of these supplements are glucosamine, chondroitin, SAMe, etc. Arthroscopic Surgery: Well, this is not a proper knee replacement surgery, but it is something done by the doctors to give a painless treatment to patients. In this surgery a thin tube with a tiny camera is inserted in the knee on the end through a small opening in the skin to view the inside of knee. The surgeon can then remove damaged cartilage. They can further clean or flush the knee so that the damaged cartilage can be removed and this will lower the pain. If after trying all the above options it is not working and still the patient is suffering from the knee joint pain then the last option left is the knee joint replacement surgery. It is the most effective treatment amongst all which are mentioned above and will give the full time relief to the patient. It also improves the ability to move. Before choosing the treatment options, it is necessary to learn everything about it. 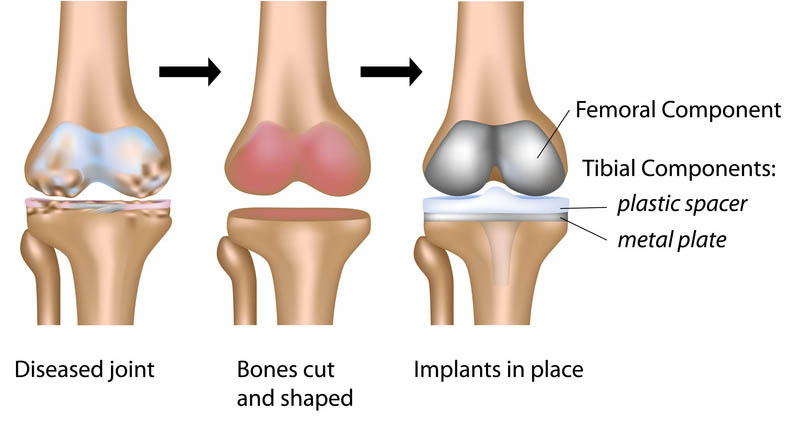 In this surgery, the damaged part of the knee is replaced with the artificial joints which are basically made from plastic and metals. However the recovery from the disease can take a longer period of time but the lifetime or relief for a longer period of time is guaranteed in the same. We are mentioning here few of the conditions that signify that you might need a knee joint replacement treatment. Check out the warning signs and choose for the treatment. Severe Knee Pain: If you are experiencing continuous and severe knee pain then it is a sign that something is not right. You may need a treatment immediately if the pain is not going even after the best remedies used. Continuous Knee Pain throughout the Day: If you are getting moderate pain throughout the day in and around your knee joint area then it is also a sign that you need a special treatment now. Long Lasting Knee Inflammation or Swelling: In case you are noticing long lasting knee inflammation or swelling then also you are required to take instant medications or treatment for the same. Knee Stiffness: The stiffness in and around the knee joint area, is also the sign that there is some severe problem that needs instant treatment. A Bowing around Knee: A bowing around the knee is something that should not be ignored in any case. You should always take care of the small changes in the body as it may save you from big diseases. No Relief from Pain Killers: If you are getting severe pain and no pain killer is helping you out in the same then it is required that you should go for a doctor’s consultation by the earliest. It is a sign that may be you require a knee joint replacement treatment. There is no doubt in the same that knee replacements have emerged as a mainstream surgery. Definitely the treatment gives a lifetime relief from the pain but in the meantime one cannot ignore the side effects of the treatment as well. However the chances of complications or any sort of risk in the treatment is very low. If you are consulting good doctor for treatment then it even becomes zero, but still you should be aware of the possible problems you might face. You might face complications while taking the anesthesia. There are side effects of anesthesia that might occur during the treatment like vomiting, dizziness, shivering, sore throat, aches and pains, discomfort, drowsiness, dental trauma, allergic reactions to latex, vocal cord injury, etc. There is always a high risk or blood clot during surgery or injury. It is because the clotting process is stimulated as your body attempts to stop the bleeding and close the surgical wound. A clot is normally formed by blood cells and clotting factors working together to create a protective scab over a healing wound. The surgical procedure may stimulate clots to form in error in blood vessels, which then may block the normal flow of blood. The after effect of surgery is infection in many cases. People with rheumatoid arthritis or diabetes have a greater risk of infection in the weeks following a procedure. Researchers believe they have higher complication and mortality rates because of their altered immune system. Also keep in mind that if you have an infection in another part of the body at the time of your knee operation — in your mouth, kidneys, or prostate, for example it could lead to an infection in your knee months or even years later. If a person has allergy to metal then it may also complicate the case after the surgery. Some people may suffer a reaction to the metal used in the artificial knee joint. The metal materials used in implants are typically made from titanium or cobalt-chromium-based alloy. In some of the cases, it has been found that the wound and bleeding complications emerge. It is probably due to the sutures or staples used to close the wound are typically removed after about two weeks. Wounds may sometimes be slow to heal and bleeding complications can occur for several days following surgery. However, in some of the cases it has also been found that patient do experience a Baker’s cyst, which is a buildup of fluid behind the knee. This may require draining with a needle to remove the fluid. One of the common side effects of knee joint treatment is knee stiffness. Scar tissue or other complications can sometimes affect motion in the knee. This problem can often be resolved with special exercises or physical therapy. 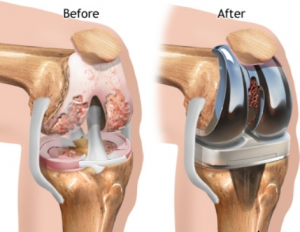 Knee replacement surgery is considered to be one of the complex treatments. To ensure that you don’t have any side effects and you recover in the best time, always take the consultation from an experienced doctor in the same. As there are many doctors in and around that it might becomes tough for you to decide as which one can give you the proper treatment, you should research on the same. Good research would always help you in spotting a doctor that can give you the best treatment. Checking the past patient’s history of the doctor would also give you an idea if you are moving in the right direction or not. 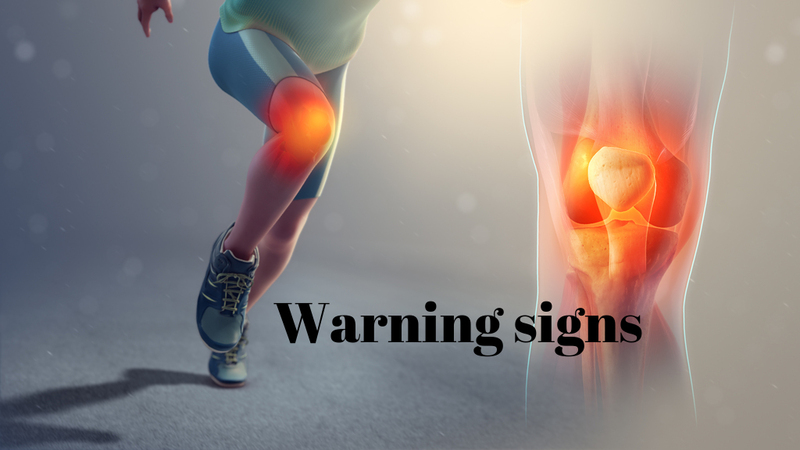 Taking any sort of risk, even after spotting the warning signs of knee osteoarthritis can lead to severe problems by the end. So, you should go for the timely treatment and advice for the same.